A Year of Being Here: David Allen Sullivan: "Permission Granted"
"Permission Granted" by David Allen Sullivan, from Strong-Armed Angels: Poems. © Hummingbird Press, 2008. Art credit: Detail from untitled photograph (image 5 of 5) by AP Photo/Marco Garcia (originally color). 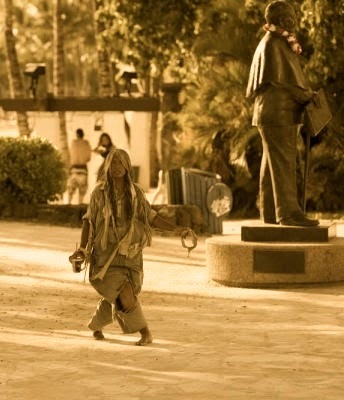 From the caption: "a [homeless] woman is seen walking near Waikiki Beach, Friday, May 13, 2011 in Honolulu." I'm sorry that I only now became aware of your comment (this project is no longer active. Happy that you're happy that I posted your poem. I hope my posting brought you some new readers. Deep peace to you.